When you’re a writer, whether you be full time and making a living for it, or a professional part-timer who doesn’t yet have that luxury (yes, full-time authors, I can hear you chortling in astonishment at my naivete), it’s churlish to complain about deadlines. They mean you have a lot of things going on, and that’s a hell of a lot better than having too little. Yet, deadlines come with problems of their own, as you can imagine. 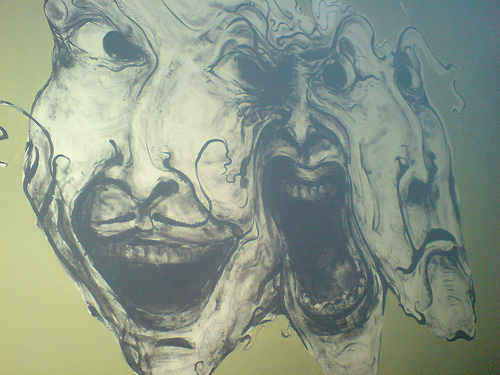 Most of them make your face do things like the above painting, found on a bar wall in Krakow a few years ago. The painting had no title that I could see, but in my heart it is called Portrait of the Author. Some deadlines, are self-imposed things, necessary if you want to get things done. Without imposing a deadline on something, it drifts aimlessly, and can sometimes be abandoned. Some are imposed, when you’ve been commissioned to write a certain piece on a certain date. Some are -soft-imposed, when you’re writing for an open call for a specific book or magazine that has a closing date for unsolicited submissions. When all three are clashing, it can become difficult to work out what your priorities are. That happened to me last week – too much, taken on all at once. With the clearance of one project (the first draft, at least), I feel a little more room to breathe. That project still needs work, but it’s in a separate phase – editing now, instead of drafting, which is a discrete area of my head that doesn’t mind working alongside drafting other things. I’ve no idea yet what will stay and what will go from the first wash of words, but the first line is a riff on one of my favourites in all fiction. As it may not survive the first edit, you can have it for free.